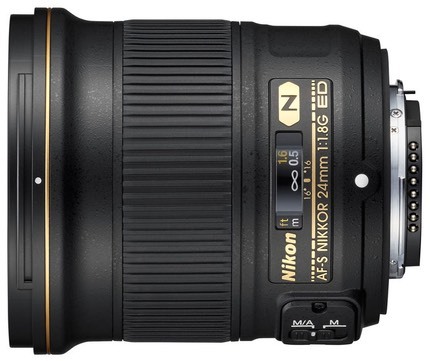 Nikon today introduced three new F-mount lenses, two of which are likely to be of some interest even to DX users. First up, we have the long-anticipated 24mm f/1.8G, which pretty much rounds out the f/1.8 line up of primes. We now have 20, 24, 28, 35, 50, and 85mm lenses in this line. As with the previous f/1.8 primes, there’s no particular outstanding feature: the 24mm is another solid prime with the features you’d expect at a US$750 price. DX users will have some interest in this lens because it gives them very close to a 35mm equivalent prime for the first time in the Nikon lineup at a more DX-affordable price. 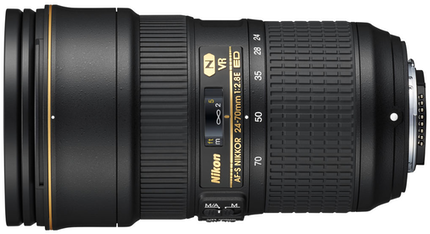 Next we have the replacement for the 24-70mm f/2.8, this time with E designation (electronic aperture control) and VR. (Curiously, Nikon lists this lens as “compatible with 35mm film,” but even the most recent F6 body has restrictions with this lens because of the E-type aperture use.) This is a full redesign and features some glass Nikon hasn’t used before, including an aspherical ED element, and a new High Refractive Index element. The MTF charts for this lens look very promising, and Nikon is touting the corner and bokeh aspects compared to the previous lens. But the big story for most people will be the inclusion of VR. Unfortunately, all that comes at a higher price: US$2400. Other bad news is the larger 82mm filter ring up front and 170g addition in weight. If you thought the original 24-70mm f/2.8 was big (and it was), the new one is bigger. 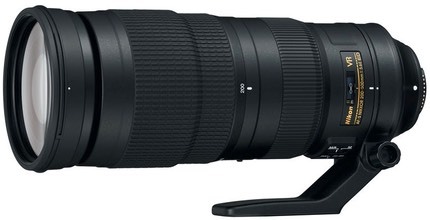 Finally, we get the surprise 200-500mm f/5.6E VR. This lens appears to be targeted at the budget-conscious telephoto enthusiast—which would certainly include DX users—and it’s missing a few things that I would have expected while adding a couple that weren’t. This lens doesn’t have Nano coating (the other two new lenses do), let alone fluorine coating. But it comes with a tripod collar, which is a surprise (the recent 70-200mm f/4 and the 300mm f/4E made that optional, thus the surprise). It also has a focus limiter switch. Up front it requires 95mm filters (no drop-ins for this lens). Minimum focus is a relatively short 7.22 feet (2.2m) for such a long focal length. At about five pounds, it’s not light, either, which makes its US$1400 price look like a mistake. At that price, if this lens performs well, it’s going to be a giant hit and sell out almost immediately. All three of these lenses are ones that subsets of the serious Nikon user base are going to be interested in. The 200-500mm looks like a clear bargain if it performs well, the 24-70mm is a bit of a disappointment in its girth, while the 24mm fills out a useful lens set for many of us. I’ll have more to say about these lenses in the near future.